Each year, there are dozens of Lovecraftian writings released. Anthologies “based on,” novels “inspired by,” and other odd assortments of mythos-based material regularly appear on shelves. While many of these works are interesting, they fail to achieve that magical, almost alchemical blend of Lovecraft’s style and mythos, the modern writer’s voice, and creepy, disturbing stories. 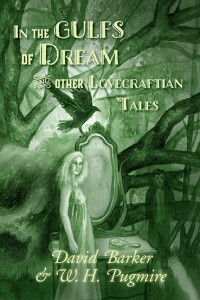 In the Gulfs of Dream and Other Lovecraftian Tales, a joint effort from authors David Barker and W.H. Pugmire, sets lofty goals from the title, and most importantly, lives up to those goals in spades. Co-writing is tricky business. How do both authors blend distinctive voices into one cohesive story? What of the individual stories? How does each voice remain unique, while at the same time, still maintain an overall cohesion in the collection? Barker and Pugmire flow seamlessly throughout the co-authored tales. Each has also penned individual stories, and never once does any single tale stand out as awkward or “shoved” into the collection. The opening story, “The Stairway in the Crypt,” is a frightening tale in classic the Lovecraftian vein. Dark corridors, fortune telling, gloomy tombs, and hints of otherworldly horrors fill the pages. The language is delightfully elegant and horrifically Gothic. Lines such as “In a single instant, Lunulae imploded, shriveling into a deteriorated shell of a dead body: a framework of pale bones encased in crumbling shards of dried flesh” set a tone that haunts the pages of every story here. The archaic is everywhere. In “The Recluse” by David Barker, we feel the strains of Lovecraft’s “The Outsider” turned on its head. Instead of escape, our protagonist accepts his fate as a pariah among society. The weight of time sits upon his head. Eternal fate drags at his heart. “Midnight Mushrumps” by W.H. Pugmire blends the Lovecraftian tradition of a malignant natural world with humanity’s insatiable appetite for nightmares, and brings it to a terrifying crescendo. My only fault with the collection is the use of females as plot devices. There are one too many succubus demons; one too many alluring, monstrous women. Lovecraft’s original texts were very masculine, but times have changed. Lovecraftian authors have the opportunity to expand the mythos for twenty-first century readers. In the immediate years following Lovecraft’s death, his worlds became the foundation for a legacy that’s lasted for decades. If the mythos is going to continue, it must speak to the audiences of today. By moving beyond older constructs of race, gender, and sexual orientation, Lovecraftian authors will open the door for an entirely new generation of world-building. Barker and Pugmire reach for that goal, but fall short. Even with this shortcoming however, In the Gulfs of Dream and Other Lovecraftian Tales is a great collection. The vivid imagery comes to life through the skilled use of complex language. The Lovecraft worlds are definitely present without being overly “homage” and cliché. Compelling narratives lure you into dark places, and before you know it, you are lost in shadows, lurid hallucinations, and alluring fantastiques.